The Great Depression did not spare the most vulnerable citizens. 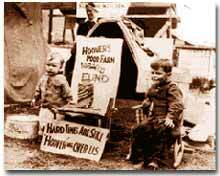 The Bonus Army's protest of 1932 made this point by including families with young children in its march on and encampment in Washington, D.C.
President Herbert Hoover had the distinction of stepping into the White House at the height of one of the longest periods of growth in American history. Less than seven months after his inauguration, the worst depression in American history began. Undoubtedly, the fault of the Great Depression was not Hoover's. But as the years of his Presidency passed and the country slipped deeper and deeper into its quagmire, he would receive great blame. Urban shantytowns were dubbed Hoovervilles. Newspapers used by the destitute as bundling for warmth became known as Hoover blankets. Pockets turned inside out were called Hoover flags. Somebody had to be blamed, and many Americans blamed their President. Running for President under the slogan "rugged individualism" made it difficult for Hoover to promote massive government intervention in the economy. In 1930, succumbing to pressure from American industrialists, Hoover signed the Hawley-Smoot Tariff which was designed to protect American industry from overseas competition. Passed against the advice of nearly every prominent economist of the time, it was the largest tariff in American history. 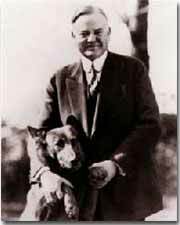 A robust, young Herbert Hoover, posed with his dog "King Tut" in a photograph used in the 1928 presidential campaign. The amount of protection received by industry did not offset the losses brought by a decrease in foreign trade. The Hawley-Smoot Tariff proved to be a disaster. Believing in a balanced budget, Hoover's 1931 economic plan cut federal spending and increased taxes, both of which inhibited individual efforts to spur the economy. 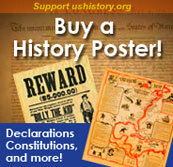 Finally in 1932 Hoover signed legislation creating the Reconstruction Finance Corporation. This act allocated a half billion dollars for loans to banks, corporations, and state governments. Public works projects such as the Golden Gate Bridge and the Los Angeles Aqueduct were built as a result of this plan. Hoover and the RFC stopped short of meeting one demand of the American masses — federal aid to individuals. Hoover believed that government aid would stifle initiative and create dependency where individual effort was needed. Past governments never resorted to such schemes and the economy managed to rebound. Clearly Hoover and his advisors failed to grasp the scope of the Great Depression. Completed in 1937, the Golden Gate Bridge was a result of President Herbert Hoover's Reconstruction Finance Corporation. Its art-deco design reflects the opulent style of the 1920s. The stage was set for the election of 1932. New York Governor Franklin D. Roosevelt won the Democratic nomination on the fourth ballot of their national convention. Roosevelt promised "a new deal for the American people" that included a repeal of the prohibition amendment. The Republicans renominated Hoover, perhaps because there were few other interested GOP candidates. Election day brought a landslide for the Democrats, as Roosevelt earned 58% of the popular vote and 89% of the electoral vote, handing the Republicans their second-worst defeat in their history. Bands across America struck up Roosevelt's theme song — "Happy Days Are Here Again" — as millions of Americans looked with hope toward their new leader. I am writing to you for some of your old soiled dresses if you have any. As I am a poor girl who has to stay out of school. On account of dresses & slips and a coat. Read some of the heartbreaking letters written by children to the First Lady during the Great Depression. "On Christmas eve I had wished for Santa Clause to come but my mama said the chimney was blocked & he couldn't come, so I had a poor Christmas."